Renewable sources cannot cover more than 30% of our energy demand within the next 25 years. A clear-cut strategy for continued deployment of fossil energy sources is unavoidable in which fruitful competition and a level playing field for all commercial forms of energy is needed. The international agenda for energy should be leading. A European strategy with sustainable energy in the form of electricity for households and in buildings, and fossil energy with CCS (carbon capture and storage) for industrial purposes is recommendable. The transport sector might very well become the next sector to switch from mainly fossil fuels to sustainable energy. Carbon capture, storage and reuse will be an indispensable part of our energy system in the next few decades. We cannot expect global warming to go so fast that it will remodel our energy consumption on a Brazilian or Indian footing. Although, if we don’t use our fossil energy sources in a much cleaner and more efficient way…. Fossil energy with CCS is unavoidable. Who are the parties best equipped for this development? Once again we should look at the regions that are most in need for energy: USA, China and Japan. But we should also seriously consider the positions of the large producers, they have strongholds to defend: Russia, the Middle East and again the USA. A major shift to electricity is clearly the best way to develop fossil energy use with CCS. Deployment of fossil base materials for industrial use and centralized energy (i.e. electricity) production is the best way to combat the environmental drawbacks. Moreover, this is complementary to solar and wind energy. Would Saudi Arabia consider electricity production and export from their existing oil and gas wells combined with solar energy from their hot and empty desert? They have the resources, and the technology is there. Are high voltage cables, at or below the sea floor, more easily protected than oil or gas tankers? Can we use the CO2 to make the deserts blossom again? It might be more than just a dream. 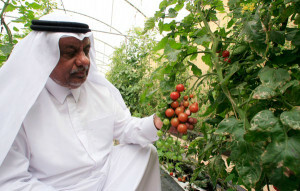 Would the Arabs use their CO2 and sunlight to produce a ‘greener’ desert (photo: greenhouse project in Qatar)? Will Russia move away from its wasteful economy and build partnerships with China? Will the concept of sustainability ever make ground in Russia and can we envisage a link with food for China? Remember the deal of China with Ukraine allowing 5% of its total surface for food for China. We might see powers at work here that will go beyond European energy and agricultural policies. Or are we going to be clever enough to participate with our know-how and expertise in both energy technology and agro-food experience? As for the USA we can be short. The strategic desire to be self-supporting in energy is within reach and pervasive. However, the greed with which this desire is put to practice is quite perplexing. 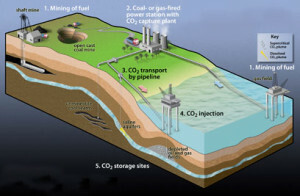 Substitution of gas for coal and oil as such will reduce CO2 emissions, but the present negligence in shale gas exploration and exploitation is destroying the benefits for the greater part. The American practices can teach Europe how shale gas should (not) be recovered. There is no good reason not to bide some time, develop a public debate and come to an agreed policy. Most of our attention should go to China and Japan. What are China’s priorities? Apparently safeguarding food supply comes before energy security. Both issues are of huge dimensions allowing ample business opportunities to many European countries. In particular our agro-food expertise should find great chances for commercialisation. For reasons of environmental concern, China could very well be the first in the world to apply clean technologies for fossil energy. We should be their partner. Japan could very well be the country teaching us numerous lessons. The country has chosen solar energy as its first priority. We can expect a lot. Whereas China will continue to produce solar panels at low cost, Japan will improve and beautify them. In addition to solar panels we can expect a lot of solar gadgets. Japan can also be expected to become a major gas producing country. The country is working very hard at the exploitation of the huge resources of gas hydrates below the sea floors of its surrounding waters. These reserves are in excess of shale gas reserves. One of the Japanese developments triggers our imagination. The gas hydrates constitutes an ice cage of 24 water molecules surrounding one methane. Carbon dioxide does even fit better in this crystal cage. The Japanese expertise now aims at bringing CO2 below the seafloor in exchange for methane, which after burning provides the desired energy together with a fresh molecule of CO2 for the next round. 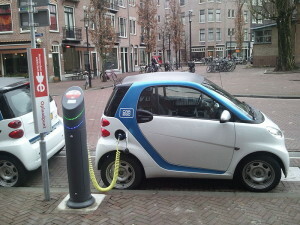 Electric car charging in Amsterdam: consumers might opt for electric transport running on home-produced electricity. Most energy studies are biased towards renewables, neglecting the fact that fossil energy will be indispensable for decades to come. Any sound strategic energy agenda should take both in full consideration and aim for mutual synergy and meaningful competition. As shown in the first two parts of this series, solar and wind energy are primarily suitable for decentralised generation and private use, in particular in the form of electricity. Public acceptance can best be reached by stimulating private deployment of wind and solar energy. Thus the public and private electricity consumption should be the first to reach 100% sustainability. The present forms of sustainable energy are hardly suitable for centralised production. Further deployment of fossil energy sources is most suitably done in the hands of (new or existing) industries as well for energy production as for the manufacturing of chemicals and materials. Capture, storage and reuse of carbon dioxide can best be done in the industrial domain, that also holds for the development and application of new or improved energy related technologies. Development of improved renewables as well as fossil energy with CCS should be stimulated in a healthy competitive environment. Learning from each other combined with fruitful rivalry. Energy for transport seems to have an intermediate status. After having reached full sustainable electricity supply in the private sector, transport is likely to become the second sector to become sustainable. Pressure might come from two sides. From consumers: they may get to like a sustainable electricity production of their own and may massively switch to electric vehicles. And from policy: India and China might have to opt for electric transport for a number of reasons. Environmental issues might come first but they might also need automated transport in order to prevent huge traffic jams. The Chinese acknowledgement of greater importance of their social networks above individual freedom might come in as a stimulant. Heavy transport is expected to remain in the domain of fossil energy resources for many years to come. Of course, better sustainability is welcome as for example in the use of home-grown biodiesel or green gas in the agricultural sector. Natural gas, partly bio, will remain the main energy carrier to heat our homes. The present efficient infrastructure will not be dismantled overnight.